A bio cellulose mask infused in a deep conditioning Ayurvedic Kashayam or serum, to instantly immerse skin in long lasting hydration and a radiant sheen, in just one use. 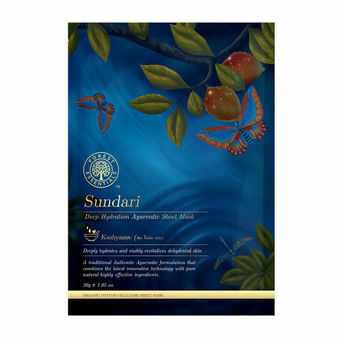 The silken texture of the Forest Essential Sundari Sheet Mask sensuously adheres to skin to drench thirsty skin cells with moisture replenishing and skin restoring actives that leave your complexion ethereally dewy, buoyant and smooth. Explore the entire range of Sheet Masks available on Nykaa. Shop more Forest Essentials products here.You can browse through the complete world of Forest Essentials Sheet Masks .